The Vancouver Condo Buzz » The Views at Coal Harbour Vancouver Luxury Condos, Penthouses & Estates > Only 27 Private Residences at the Coal Harbour Views Vancouver Exclusive Real Estate Development! « 9 Boutique Homes for Sale at 7&W Vancouver Townhomes in Mount Pleasant Vancouver Real Estate District from $659,900 – Ready for Move-In! 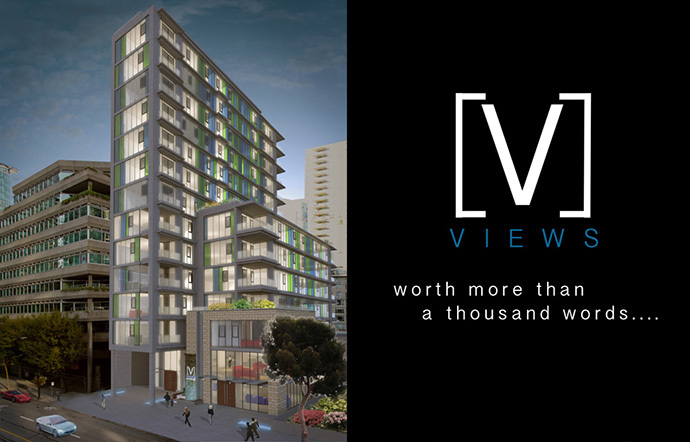 The most highly anticipated luxury Vancouver real estate development is now launching! The Views at Coal Harbour Vancouver luxury condos feature only 27 private and exclusive condominiums situated in the most exclusive neighbourhood in downtown Vancouver. The views are worth more than a thousand words and they can now be yours. 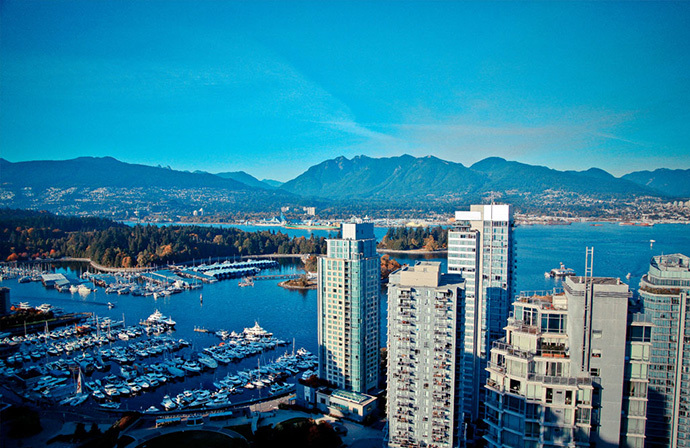 The luxury Vancouver Views at Coal Harbour Condos are brought to you by Janda Group and the Pacific Rim Group. The architecture is unique, striking and beautiful whilst the interiors are high-end and modern. The Views at Coal Harbour Vancouver luxury condos are situated in the heart of the Coal Harbour Vancouver downtown district community where you will find top rated restaurants of all international cuisines, boutique shops, entertainment options, the Harbour Green Park, seawall, Canada Place and much more! Some of the most amazing features of the new luxury Vancouver condos at The Views Coal Harbour are the uninterrupted, unobstructed views of Vancouver Harbour as well as the beautiful North Shore mountains and the downtown skyline. This central location is perfect for residents who enjoy being within walking distance to all of life’s requirements like local services, amenities, the water, mountains and of course downtown Vancouver. 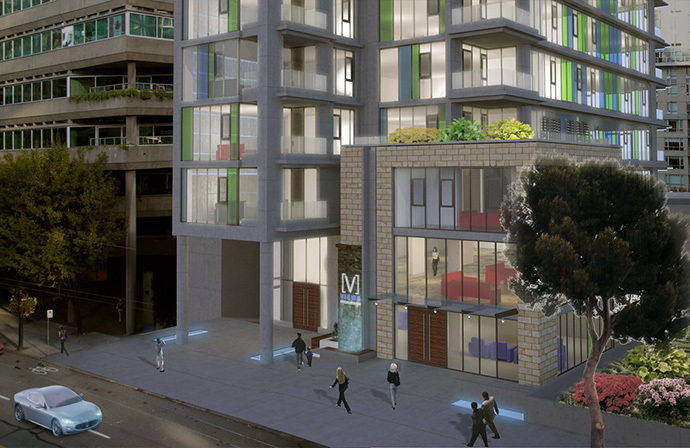 This is the most prestigious Vancouver luxury condo development of 2013. For more information, please visit www.theviews.ca. Viewings are only by appointment. The Views at Coal Habour Vancouver will offer only 27 boutique condominium residences an is the MOST exclusive and luxurious downtown residence. 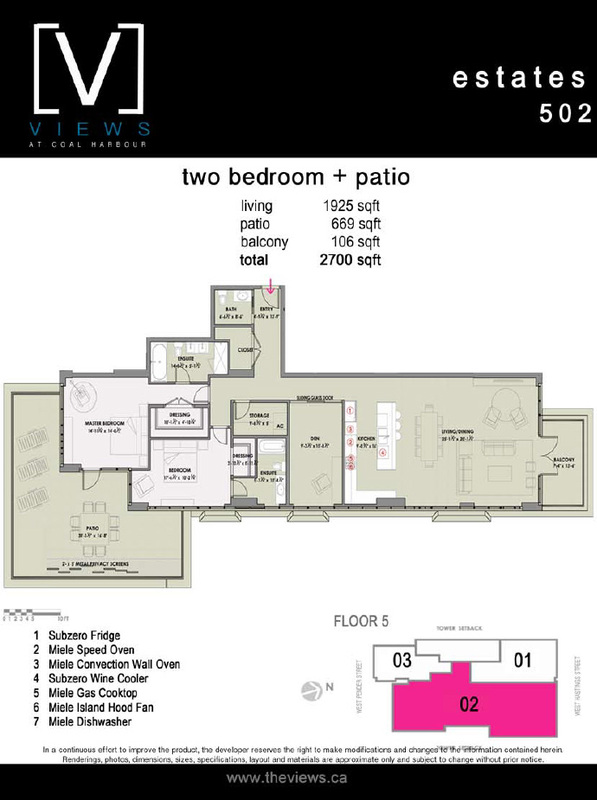 The Coal Harbour luxury condos are divided into 3 different styles: The Views Residences, Penthouses and Estate Homes. The Views Residences in Coal Harbour are located on the 1st to 9th floors of the high-rise building and will include floor plans ranging between one bedroom to two bedroom and townhouse layouts. These luxury Vancouver downtown residences will have a maximum of only three homes per floor, making them very exclusive and unique to the area. All will present a perfect balance of functionality and luxury with outstanding views of the area, water and mountains. 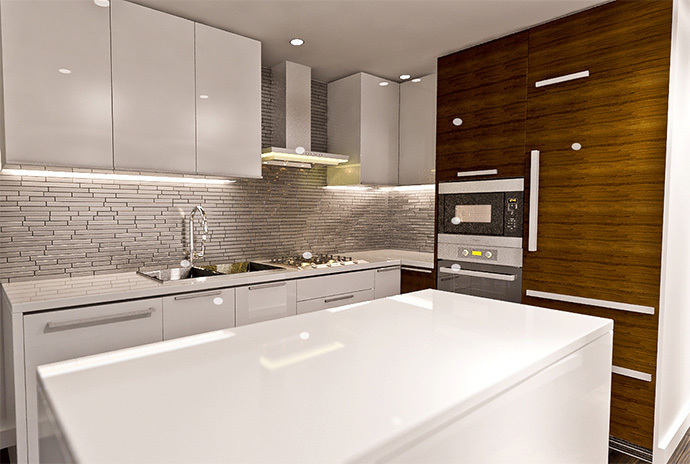 The kitchens will have Cambria engineered stone, Snaidero Sistema Zeta kitchens, KWC Livello facuet, Miele 4 burner, 24” gas cooktop, 36” Miele wall hood, Snaidero walnut accent Sistema Zeta cabinetry, 24” Miele convection oven, 24” Miele speed oven, and SubZero fridge that is fully integrated/panelled. 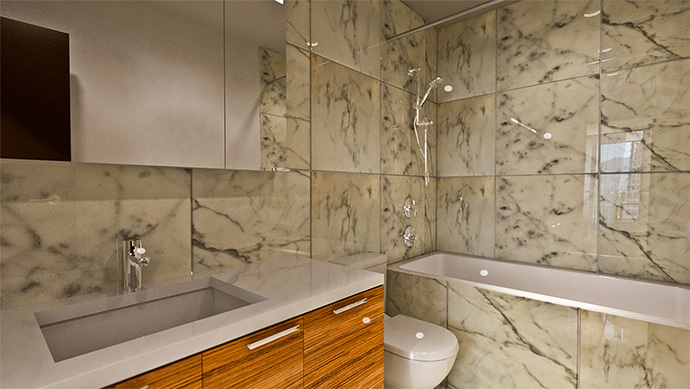 The luxury Vancouver The Views Coal Harbour Residences will also have marble wall tile (floor to ceiling), Hans Grohe rain head and shower hand held fixture, Hytec alcove tub, Villeroy and Boch floor standing toilet, teak accent cabinetry, and a high-end Hans Grohe Axor faucet. The living rooms at The Views Residences in Coal Harbour will have Kentwood brushed ash hardwood floors, and fully automated blinds through the Lutron system. 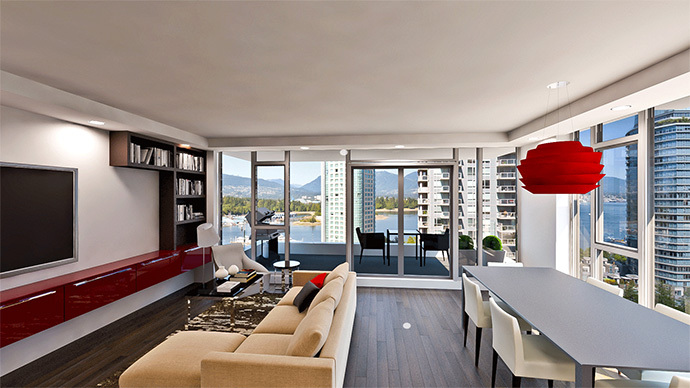 The true definition of elegance and luxury are The Coal Harbour Penthouses at The Views. 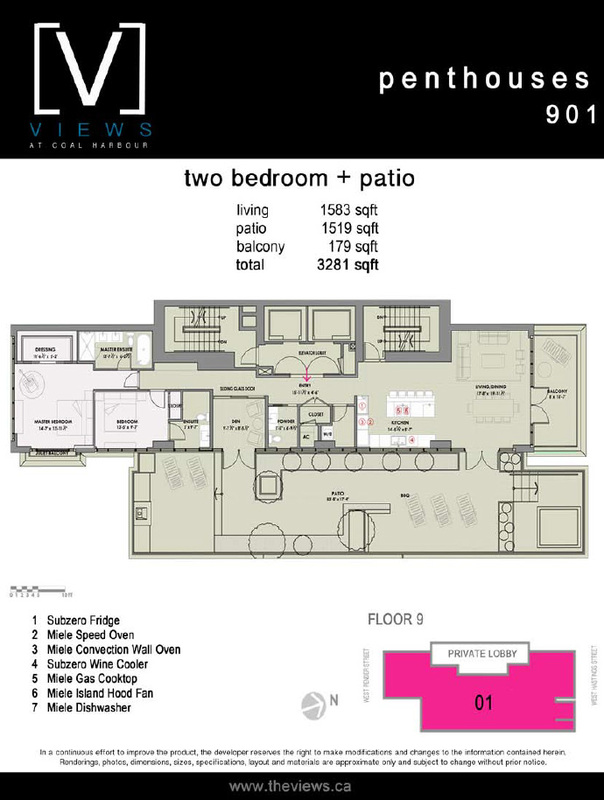 These are extremely exclusive residences that include two bedrooms and expansive 1,800 square foot residences (approx.) 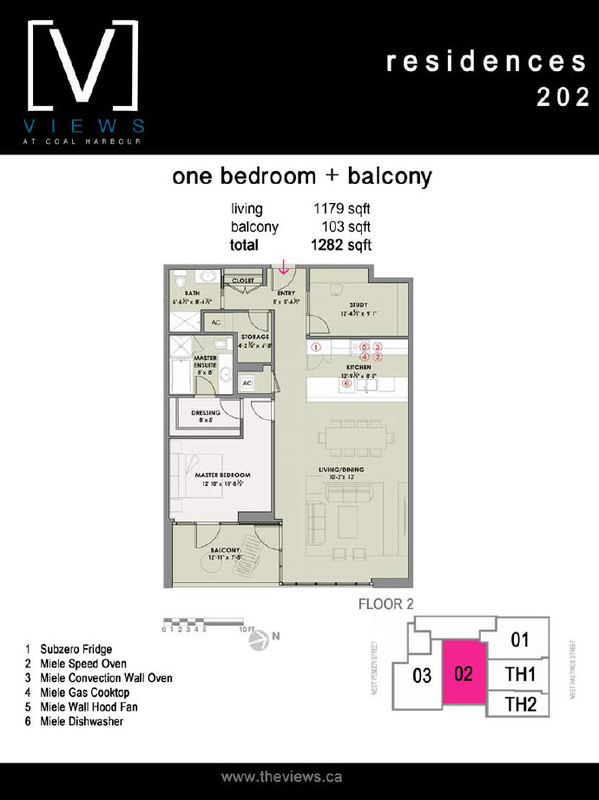 with only 1 unit per floor at The Views Vancouver downtown condos. These are the most exclusive Coal Harbour private residences with breathtaking and unobstructed views of the mountains, water and city. The kitchen features include: Snaidero Sistema Zeta stainless steel counter tops, KWC Eve kitchen faucet, Snaidero red accent cabinetry, Snaidero Sistema Zeta kitchens, Miele integrated dish washer, Miele 5 burner cooktop, 36” Miele island hood fan, SubZero fully integrated fridge, 36” Miele convection oven, and a 36” Miele speed oven. 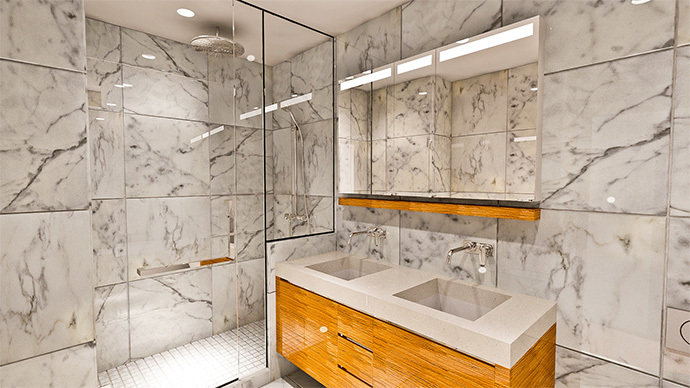 The bathrooms/ensuites at The Views Penthouses in Coal Harbour include teak accent cabinets, Hans Grohe Axor faucet, marble wall tiling from floor to ceiling, and amazing separate walk in showers and deep soaker tubs. The Estates at Coal Harbour are two bedroom homes starting from 2,000 square feet that overlook Vancouver Harbour and the Coal Harbour neighbourhood and marina. The Views Estates in Vancouver also feature spacious outdoor spaces. As with the penthouses, the Coal Harbour Views Estates also feature premium Snaidero Sistema Zeta stainless steel kitchen countertops, fully integrated fridge by SubZero, 36” Miele convection oven (wall) and a premium 36” Miele speed oven. 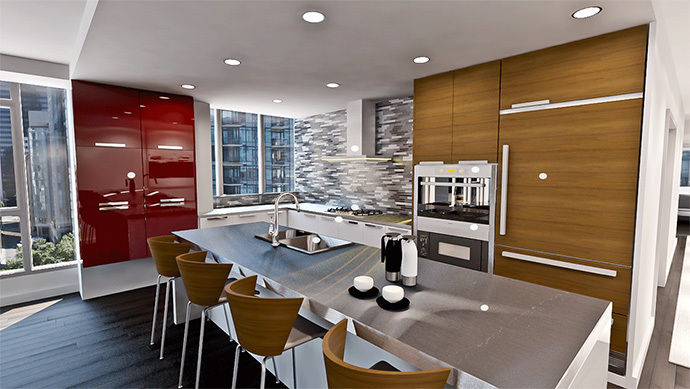 Also, the Views Estates in Coal Harbour Vancouver will feature a KWC Eve kitchen faucet, Snaidero Sistema Zeta kitchen, Miele burner cook top, Miele hood fan and striking Snaidero red accent cabinets. The living spaces have high-end Kentwood rushed oak hardwood floors while the bathrooms have deep soaker tubs, Villeroy and Bosch toilets, marble tiling, Hans Grohe rain head and shower hand held shower fixtures (separate from tub) and beautiful walnut accent cabinets. In addition to its central Coal Harbour location as well as it’s prime views, The Views Vancouver luxury condos will also feature a state of the art on-site fitness centre that includes over 2000 square feet of resort style private gym with yoga-meditation room. One of the most impressive features of this fitness room is that is overlooks the city with floor to ceiling windows. The high-end fitness equipment at The Views Vancouver Coal Harbour luxury condos is by world leading “technogym”. The Fitness Centre itself at The Views Vancouver Coal Harbour luxury condos is divided into 4 separate sections that include yoga-meditation, kinesis, spin room as well as aerobics/weights. The grand entrance lobby will also be very impressive. Details to come. The other notable feature of the luxury Vancouver Coal Harbour condos at The Views includes the leading edge Lutron RadioRA2 automation and home automation ready features for each and every home. The Lutron RadioRA2 automation system at The Views Coal Harbour Vancouver luxury condos will automate blinds, climate/temperature controls, lighting control and dimmers/shading as well as multi-media for media services, rough-in cabling and iDevice for tablets and smartphone devices. This is truly an amazing system as we have it at our home. As well, some select homes at the Coal Harbour Vancouver Views condos for sale will come fully integrated with Control 4 and Lutron RadioRA 2 automation which is synchronized with home entertainment audio and video packages including automation for 4 zone distributed audio/video with in wall speakers, in ceiling speakers and 5.1 home theatre surround system by Sonance, Denon Receiver, Shaw/Telus PVR, Apple TV, Bluray Player, iPod/iPhone dock, Sonos Zone player, external inputs in addition to Lutron integration, full Control 4 home automation, IP camera security, in wall touchscreens and unlimited number of tablet/smartphone devices.